Last week, we covered FastForward.xyz, a convention discussing the effects of technology on the future of the music industry. 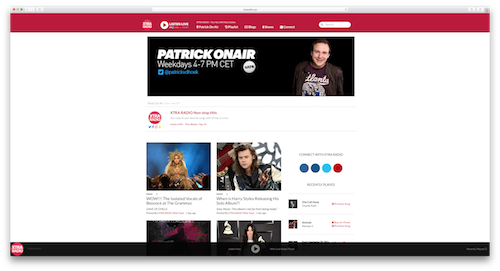 With this week’s #WebsiteWednesday, we want to bring music to your ears by showcasing an example of an online radio station that recently rebranded to connect to the next generation of music listeners. Meet XtraRadio.xyz! XtraRadio.xyz is a free online radio station from the Netherlands. Previously on XtraRadio.nl, they transitioned to a .xyz domain and expanded their reach to a more global audience. XtraRadio plays all of the latest hits nonstop throughout the day and casts two live shows – ‘Patrick On Air’ and ‘Covers with Mike Adams’. Between Patrick and Mike, there are years of experience in both radio and TV. Having worked for companies like VH1, Tribune, and iHeartRadio, Mike Adams has even interviewed stars like Kanye West, Steven Tyler and Aaron Eckhart. XtraRadio also has a blog, which includes coverage from recent music-award shows like the Grammys, updates on anticipated album releases, and news about all your favorite musicians and actors. XtraRadio.xyz is another compelling showcase of a local brand aiming to expand their reach globally, through the internet, on a .xyz domain appealing to every tune, everywhere. The next time you can’t figure out what to listen to, let XtraRadio.xyz do the picking for you!